UPDATE 8/28/13: The First Ever Criminal Justice Film Festival on Oct. 20/21 in Los Angeles grows out of Susan’s efforts. UPDATE 12/3/12: Susan will be a guest on TWE Radio 12/29 -30/12. UPDATE 12/2/12: “A New Way of Life” celebrates with their 14th Annual Fundraising Gala Dec. 9th in Los Angeles. Guests will preview a new documentary, “Susan,” based on Burton’s life and how she has transformed the lives of over 600 women. 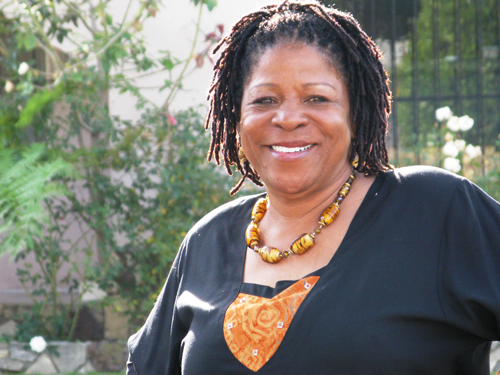 Susan Burton is the founder of an award-winning reentry program for female ex-offenders in South Los Angeles. To date, her non-profit organization “A New Way of Life” has helped more than 500 women once incarcerated get back on their feet. Susan knows how difficult life can be. After her 5-year-old son was accidentally killed in 1981, she ended up in prison six different times. She got clean in 1997 and never looked back. This year she was nominated to be CNN’s Hero of the Year and is now one of the final ten candidates from more than 100 countries. The winner is decided in November by people who vote online here. The total prize is $125,000. I interviewed Susan eight years ago for womensenews.org. I sensed then she was someone with very special talents. When I heard about her recent success, I was thrilled for her and wanted to find out about this Hero of the Year nomination and how her reentry program was doing. EYE: Congratulations, Susan, on your Hero of the Year nomination! Did you ever think you’d become an international hero? SUSAN: No, never. It is quite an honor. I just thought if I could help a few women like me who were trapped come back home to South LA, that was my goal. It just sort of took on its own steam and synergy, and it’s absolutely taken me with it. EYE: I’ve read where you’ve won another award. On Oct. 12 you receive Harvard University’s Kennedy School of Government’s Gleitsman 2010 Citizen Activist Award. You also win $125,000. What an accomplishment! SUSAN: Yes, I am going to find out what it’s like to go to Harvard. The Harvard Award was a total surprise. Harvard means the highest standard of academia has wrapped their arms around the effort I put forth. My work’s been credentialized. I never thought I would have ended up at Harvard or a “Top Ten Hero” or have built an organization like “A New Way of Life.” I just wanted to help. I wanted at end of the day to have done something good. I struggled to get to a community college and to take a few classes on psychology because I needed more understanding about the subject. I got to the level where I couldn’t decipher it. What I began to learn was that it wasn’t really relevant to the people that I served in South LA. I completed chemical dependency courses, but they were not shaped around the depth of tragic incidents in the lives of women in the criminal justice system. SUSAN: This has been a tremendously difficult year trying to keep all of the programs in place with the current decrease in funding. People have been suggesting I let go of vital programs that have tremendously positive outcomes for those who aren’t served in other places. These are programs that have transformative effects on families. We have a legal clinic now and an attorney on staff when he could have gone anywhere to work. He cleans up people’s records and fights licensing boards so that these women can run businesses. He came on as a volunteer and his position wasn’t funded at first. I would love to take the money I am awarded because it is given, but I couldn’t in good conscience. It goes back into the programming. EYE: You have five houses now and are able to take 20 women at a time. How many would you like to have? SUSAN: I am stretched to capacity. My goal is to help people across the nation develop community- based reentry houses like mine. I’ve already helped three people by mentoring them, giving them pros and cons, and do’s and don’ts and supporting their dream. There’s a lady in Arizona, Nadia Valle. She wants to do a single family house in Tucson. I met her thru the CNN piece. 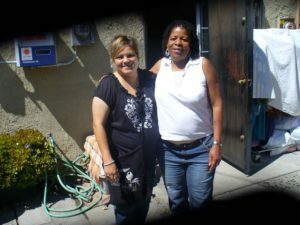 EYE: I spoke to Nadia recently to find out how her new reentry program was progressing and asked her how meeting Susan had helped her. NADIA: Susan’s my idol. When she got the first award and before she was in the top ten, I clicked on the CNN site. Reading about her just really touched me. I kept thinking about it. She said that she was very touched and would help me in any way she could. She invited me to Los Angeles. I wanted to connect with her and meet her. She gave me a tour of her homes. I was very impressed at how simple and outgoing she was. EYE: What did you think Susan would be like? NADIA: I thought I’d meet a uptight woman in a three-piece suit driving a Lexus. What a wonderful woman she was. I gave her a willow tree angel that signifies different things. Her angel signified hope. I named my organization “Wings of Hope.” Susan’s been holding my hand on modeling “A New Way of Life.” My organization is almost identical. EYE: How has Susan been an inspiration? NADIA: She said there were so many doors closed on her. Susan’s one of my heroes. Look at where she came from and look at where she is now. We’ve both had many struggles. I’ve had cancer so I understand what these women are going through. I thought it was impossible to do what Susan did. She said I could do it. I’m in the process of opening a house in Tucson. Susan agreed to do a ribbon cutting when we officially open. I am doing this because it comes from my heart. I want to help these women and give them some hope. I plan to keep my job as a therapist at the hospital because I love what I do. EYE: Were you surprised when you heard from Nadia and others? SUSAN: I talked to a lot of people. Many people contacted me specifically asking for help. My hope and direction is to help people throughout the country to develop these projects so that they can manage a little house to support themselves. There’s no telling where it goes from there. I want to mentor and support them. I have lessons to teach and I know where to go for resources; I can explain opportunities and challenges and they won’t make the same mistakes I made. They’ll have someone to help. I see this as an opening to channel more. EYE: Is the need still as great? SUSAN: It’s even greater. It’s always been there; there was a great need in the beginning. It’s more than helping a few women. It’s about the way people have been looked upon who have been inside, the mentality of the composure people have taken on. It’s a big job and I’m not the only one who can do it. EYE: Do you still go and pick up the women at the bus station when they arrive after they leave prison? SUSAN: I have to do it. I don’t have a designated driver. It keeps me in touch with the women. There are things I want to know and see. When I go to the prisons, I want to see the way the guards are talking to them. The northern California prisons are too far so I ask the women to call me when they’re released and to let me know when they’re on the bus. I still pick up the darkness and hopelessness and confusion. It’s thick but it keeps me in tune with what I remember it to be and how it feels. It doesn’t go away. SUSAN: Charsleen Poe got here after being in prison for three years and had struggled with her addiction and where she would fit in the world. She went thru Women Organizing for Justice training for six months and became an intern. Now she runs our entry legal clinic. She lectures on expungements, a legal process that clears legal history. Every second Saturday we have a free clinic with an attorney on staff. She’s been with me for two years and is moving into her own place. EYE: How do you explain your success when so many women have returned to prison after being released? SUSAN: People have helped me along the way. I didn’t take that help for granted. I helped others and that is the key. People are discouraging and say what I shouldn’t do. I just look at them and know what I need to do. EYE: Do you ever get exhausted from all the pressures? SUSAN: Sometimes I get really tired but something will happen to invigorate me again. It can be something personal with a resident or something that makes me mad. Getting the outstanding recognition really helps. EYE: Where do you see yourself in ten years? SUSAN: I would hope for it to build its own energy from the demonstration of what has happened here. I would hope there are reentry leaders throughout the country. I want the idea to spread. I hope that the community will take hold of the idea. I hope that at some point they will be strong enough to stand up for over- incarceration. The sentences too long; too many are sent to prison when they could be helped in the community. We rely too much on the police for public safety; people could help out with that. If we had one percent of the LAPD budget, we could hire 200 people and give them a living wage and full benefits. We would be reaching people in an effective way other than force. EYE: What would you like to ask people? SUSAN: Please vote! It’s important if the light can shine on this program to push it forward. EYE: Thank you, Susan. Good luck with winning the CNN Award. You deserve it! Hello my name is Jerome, I just seen your segment in CNN and was inspired to try and start an organization such as yours. I work for a non profit organization in Yakima WA. And there isn’t a program like that for individuals coming out of the many prisons here in WA. I myself have been incarcerated for more then a third of my life, but have changed my life around, because I was given a chance to do better. If there’s any type of information you can pass on to me, whether it’s courses in college that I need to take, please pass it on. Thank you so much for the inspiration.